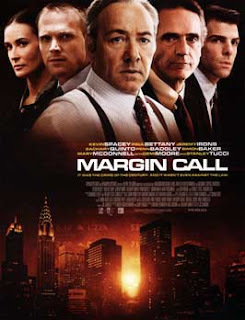 Coming out the same week as TOWER HEIST, a film that uses the financial crisis as fodder for an escapist fantasy, MARGIN CALL takes a more serious look at what caused the American economy (and world economy, for that matter) to go down the toilet. According to the film, that was a combination of greed and lax regulation that led investment firms to put far too much of their money into dubious assets like mortgage backed securities, all based on a wrong-headed business model. The firm MARGIN CALL focuses on manages to figure out how wrong they are before anyone else, although just barely. Eric (Stanley Tucci), an employee of the firm who has just been laid off, passes his information on to Peter (Zachary Quinto), another member of the risk assessment department. Peter completes the calculations and realizes that the firm could soon find its assets worthless. Soon, all the higher ups in the firm are flying in for a late night meeting to discuss how to handle the crisis and protect their interests even if it comes at the expense of other firms and “regular” people. MARGIN CALL assembles a great ensemble cast and gives them interesting characters to play, a compelling situation to play them in, and some first rate dialogue to recite. In addition to Tucci and Quinto, the other main players include Kevin Spacey, Jeremy Irons, Demi Moore, Simon Baker, and Paul Bettany, fantastic actors all. I'm not sure that the movie provides much insight into the financial crisis that hasn't already been given elsewhere, but it's never dull watching this cast bring the details to life. 3 out of 4 stars.